It is not of prayer in the sense that it is a request, a plea, like that of the faithful housewife who rushes into the church half-dripping with laundry water down her arms quickly dried on her apron, that I am talking, though it has great merit. Nor am I talking of the ritual prayer, executed according to set precepts, half-understood but duly followed through faith mixed with fear, so that what is prescribed to God be given to God, and have done, exactly as rendering to Caesar that which is Caesar’s, though there is faith and fortitude involved in it. What I would like to speak of is prayer offered to God for His grace and for gratification, both of the one who prays and the one who is prayed to, since all gratitude belongs finally to Him. At first sight, this sort of prayer may seem like a convention, a situation pre-conditioned, a polite conversation, a dialogue of two where the one who prays proffers the formalized requisite of conversation in the forms of formulae knowing they will be received and accepted by that same office as dictated its forms. In this category all printed paper burnt up as offering, all the little scented wreaths of flowers that the devotees carry into the temples, all the songs of praise and hymns chanted in, very often, cacophonous unison, etc., are included. But this is only the seemingly conventional and ‘at first glimpse’ appreciation of prayer at the first rung of the part-human ladder of expression or dialogue. This kind of formula prayer has its obvious uses and benefits, especially in areas where masses of devotees, if left to their own guise to compose their own formulae, would undoubtedly go, some into excess and thereby error, and some into complete mediocrity, not un-akin to a basically tepid devotionalism motivating the luke-warm devotee. Or again, it may fall completely short of expression and finally end in a quasi-evolved idolatry. These again are not the kinds of prayers I want to talk about. At a closer vision, however, these may be quite the opposite. Because whether it be by turning a prayer drum, sending up in flames a written sheet of paper, or offering flowers or songs, these may be, on the part of the man praying, a sincere devotional correspondence with his Lord which makes of his seemingly mechanical act a personal act of praise or of grace. This, then, no matter what his act seems like, makes of his prayer a sincere devotional practice, a communication between man and God. Yet there is another prayer which, in the ultimate man-before-God confrontation, makes of the event a communion. By this prayer I understand standing in the presence of that God which is One and Only and Unique. This supra-monotheistic concept is at the basis of all existing religions, very often hidden deep down in the recesses of its esoteric foundation, sometimes clearly hermetic, sometimes forbidden, sometimes veiled and sometimes so thinly veiled that it is blatant. This concept, however, must be clearly and definitely understood. The monotheistic God may be sometimes con­ceived as ruling over a polytheistic pantheon. It may sometimes be taken to mean a power beyond and above a manifest duality of transcendence and immanence, or of positive and negative qualities where each, since it is the negation of its opposite, then is in constant strife and war. Or it may be a monotheism of plurality and oneness, a triune singularity which represents both the plurality of the number three and the uniqueness of its own existence. Be these as they may, or any other view of monotheism, yet at the principal basis of all esoteric theology it will be found that there is always a condition attached to the theistic concept. This is the condition of an absolute and unique existent. Thus viewed in its reality, prayer becomes the highest and the purest form, the ultimate act, of the Divine Service or the Theophanic Vision. Yet this is not the ritual prayer of the temple, mosque, church or synagogue; in short, it is not the prescribed ritualistic prayer of religions, although the raison d’etre of these religious practices, including the ritualistic prayer, are designed as man’s media to arrive at, or rather, to provide means of arriving at, this Divine Service. But to do this, it is necessary for the ritual of the prayer of religions to pass beyond its ritualistic, not conformity, but emphasis. We see this happen sometimes, actualized during a ritual. Most prayer, ritualistic and religious as it may be, does allow scope to pass beyond its ritualistic emphasis. It is this emphasis of form in the ritual that binds and bounds the spirit of prayer to the performance of the ritual, not allowing it to soar as a mirror-thought to the Theophanic Imagination but remain within the limits set for it in its form. There is a situation which all religions prescribe, though set aside for the select and not for the masses. This is meditation. It is wrong to think like most Westerners that meditation is a regional practice necessitating an extreme Far-Eastern mind, a deeply Oriental attitude to religion incompatible with the Western thought-forms basically emanating from the shores of the Eastern Mediterranean whence some of the major religions of today originate. Even the latest of these, the Muhammedan religion, has it from the mouth of its Prophet Muhammed who himself instituted and made compulsory the ritual of Muhammedan daily quintuple prayer, that a single moment of meditation is preferable to seventy thousand times of ritualistic prayer. It is easy to see why meditation holds such a primordial position in the dual unicity of the concept of God and man. Meditation is ‘concentrated thought, to consider, to reflect’, says the dictionary. Where the ‘tone’ of the prayer is subject to atmosphere, a complete Divine Service seems hopelessly impossible within the realms of relative conditioning which is the atmosphere of our daily normal existence. Concentrated thought, reflection, takes us out beyond the limitations of exoteric relative existence and allows for a moment of intensive thought which can give us the necessary conditions of reaching into, or re-establishing for a while, the Theophanic Prayer, the Divine Service. In this case meditation becomes the necessary atmosphere within which real prayer finds its proper ‘tone’. Many forms of meditation exist and some are not even called meditation and pass unnoticed. There may be as many kinds of meditation as there are people perhaps, since each can, and probably does, give it a personal twist. It is to avoid such happenings which may sometimes be inappropriate or even dangerous that those who ‘lead’ meditation prefer, quite rightly, certain rules and regulations which they impose, always allowing some elasticity of course, to be able, in case the need arises, to control the trend, if not the contents, of the meditation under way. We have mentioned contents. By this we mean the focal thought or thoughts the meditators are given, or give themselves, as the point of concentration of the thought. But the essential point of the meditation remains not so much the thought, which may vary, but the concentration, which should be the criterion by which all meditation should be judged successful, or even judged meditation at all. And since this concentration is in the nature of excluding all interruptive thought or action, it can be the main criterion, again, for meditations which do not require the central thought upon which to concentrate, but eliminate all interference from thought where the perfect void is required to reside. This main condition of all meditation, this concentration, cannot be overstressed. Without it all kinds of thoughts, noises or even half-caught glimpses of things that interplay into the vision of even tightly shut eyes interfere with the successful progress of meditation. It is with deliberate intent that we use the word ‘progress’ with respect to meditation. Because, though in time a more immediate location can be achieved for the poise of this concentration, it is usually through a progression based on intensification of the process of concentration that one achieves the perfect poise. Otherwise, the Zen Buddhist meditation Master would have no need to give the helpful, though painful, whack on the shoulders of the novice. No matter how the meditation progresses or how adroit the meditator grows with practice towards reaching the necessary concentration, whether the meditation takes a focal thought, is ‘led’ or is an open meditation, in short, whichever kind of meditation it is, or how adept the meditators are, there is one rule which must always be complied with. This is the direction or the dedication of the meditation. The direction taken or given is what in the ultimate will lead to the aim of the meditation. As I have mentioned above, sometimes the meditator’s aim, the direction he will dedicate his meditation to, is the elimination of everything so as to leave him in the presence of that supreme quiet centre, that still-point which is the epicentre of all movement, of action or thought; the perfect void wherein resides the essential relationship of immanence and transcendence. Here is the cup, so to speak, fully open, the perfect flower fully bloomed, ready to receive the All ­Creational Impulse, the perfect Theophany, and merge it with the matching creaturial receptivity of the in-flowing Most Holy Effusion. This meditation does not aim at reciprocity but to alignment. It is a conscious, concentrated dialogue of expression of the Essential Existence and, but not with, its image in an active receptivity. At this moment, if it is a moment, there is no time. The meditator is beyond the confines of time which only rules within relativity. He is beyond, is aligned to, in unison, with his essence which is His Essence. The only existent there present is the One and Only Unique and Absolute Existent and His individuation as the perfected man. For this extension of the Being into the clear cup of the meditator there can be no extension, since extension presumes space, and space, like time and distance, is a rule and requisite of the relative state, and the Being may not, cannot, be conditioned by these. Nothing really happens. The meditator has not moved or changed; the Essential Being has not reached down or moved or extended Itself anywhere. In that still-point they have ‘re-met’ without ever having separated from each other, they have re-cognised their unity. The ‘tone’ was prepared by the harmony of the stillness; the intensive concentration without qualification or thought has actively prepared the receptivity of the harmonious place wherein alone can take place the Divine Self Revelation, the Theophanic Prayer, the Divine Service. This is not a re-enactment of an original unity of Being. On the contrary, this is the aim and purpose of the Creative Imagination, which in its reality being out of time, is permanent and ad infinitum. Again, this is the sole cause and purpose of there being man at all, so that he can fulfil that which is required of him, the establishing of that condition of prayer which is the Unity of Being. There can be no greater prayer and there can be no superior meditation. This is the apotheosis of all prayer and meditation. 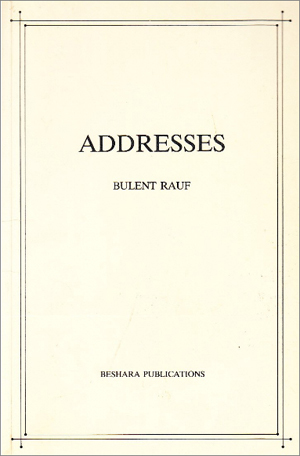 A German translation of Bulent's Addresses I and II is now available under the title: Unterwegs in der Einheit des Seins from Chalice Verlag, 2017. 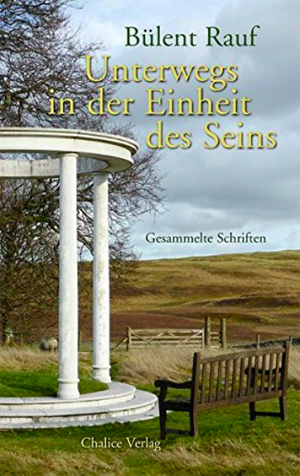 There is also an interesting new introduction to this publication translated into English and available on beshara.org.